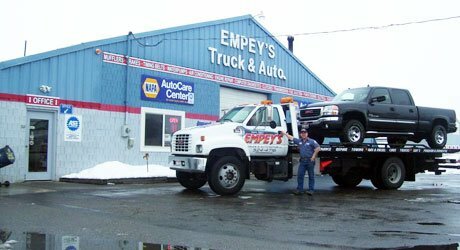 Empey’s Truck and Auto Repair in Ammon, ID, is the trusted choice in Idaho Falls for automotive repair, service, and maintenance since 1987 and counting. We take great pride in the quality of our work and the service that we give our customers. We are always improving our service by keeping up to date with new technology and having the best tools in the industry. Our shop is AAA approved, which requires an intense certification to complete. We are also a NAPA AutoCare Center, which is a network of the best auto repair shops in the industry that meet certain standards and criteria of the best service and repairs. Our shop was opened up by Bruce Empey back in 1987, who has over 37 years of experience in auto repair and maintenance. He loves working on cars and trucks and anything that has an engine. He likes to make them work better and last longer! Outside of auto repair, Bruce enjoys riding snowmobiles, camping with family, and working on his family farm. We want to give back to our community as much as we can. We donate to little league teams and we have supported the boy scouts and our local high school teams as well. Our goal in this business is to provide high quality auto repair and excellent customer service all the time. We want to give our customers choices and options that best fit their situation, plus giving them the information they need to make those decisions.